« What is a Nihola? Deluxe Flying Pigeon PB-13 with basil Kavan II Bags. Well, spellbinding to us at least! He typically takes a very thorough look at antique and old-fashioned bicycles throughout Asia. Jeff did us the honor of featuring several of our “deluxe” versions of the Flying Pigeons we assemble here in our Los Angeles workshop in a recent blog post. More images of our deluxe Flying Pigeon bicycles available in our Flickr set, “Deluxe Flying Pigeon Bicycles“. If you’re interested in having us build you your own custom Flying Pigeon, send us an email at info@flyingpigeon-la.com The Flying Pigeon Racer starts at $479. 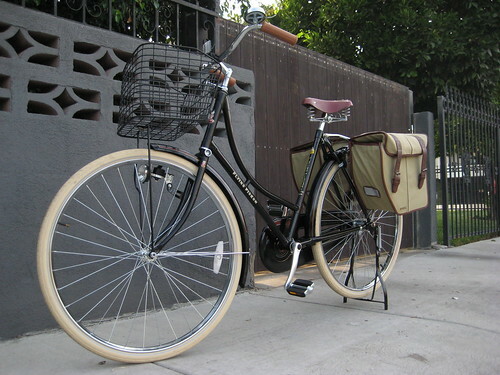 Our “Deluxe” roadsters are typically in the $500 range, with options (Velo Orange or Brooks saddles; 3- or 5-speed hubs; pannier bags; Wald, Basil, or DHS baskets; Bobike baby carriers) the price can climb up to $700. We’re the only shop in the U.S. custom building 28″ (635mm) rims, so pitch it to us and we’ll make it happen!